“Ah, Salaam and good evening to you worthy friend. Please, please, come closer” — if you think your loved one would recognise those opening lines from Disney’s Aladdin, then you really do need to come closer and take a look at our magical Disney wares. Be our guest! 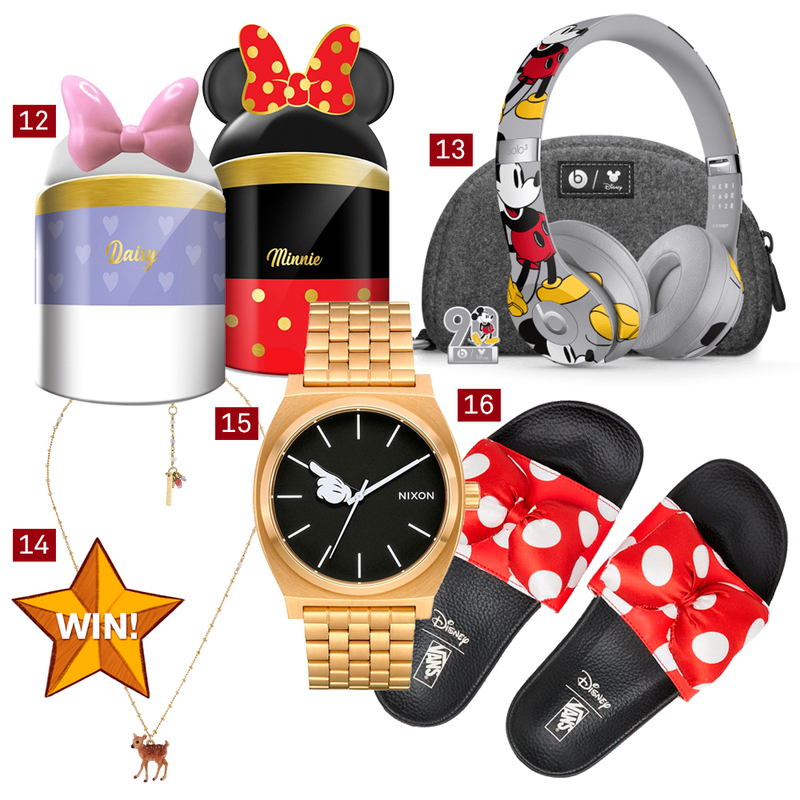 These aren’t just your regular thingamabobs, whozits and whatzits, nor are they the bare necessities; we’ve gone the distance and put together this year’s best Disney collaborations for you, the gift-hunter, so you’ll truly have no worries (for the rest of your days). It helps that this year’s Mickey’s 90th birthday as well, so boy oh boy have the brands gone all out to celebrate! If your friend’s still dreaming of a true love’s kiss, tell them to let it go — you’ll fulfil that wish upon a star instead with something more practical, yet just as dreamy. Go on, get down to business already! Available at MDREAMS boutiques, selected retailers. You’ll wanna get your hands on these! 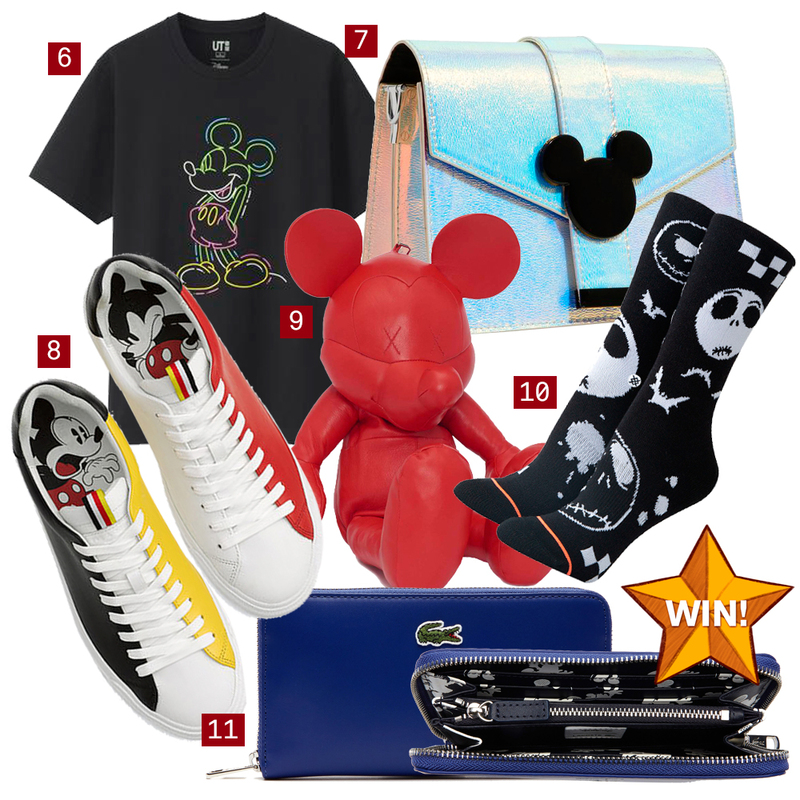 The cutest bags and shoes for junior, where Melissa goes all out on the Mickey motifs — kids that age can pull it off anyway! If the kidult in you is looking for something more subtle, take a look at their flats and sneakers with just a hint of mouse ears and polka dots. Singapore-based watch company, Plain Supplies, has collaborated with Disney to release a limited-edition collection of watches inspired by Mickey! These minimalistic pieces are great for any occasion, and we especially adore the peeping Mickey Mouse head; it’s the embodiment of quality and class. P.S. All NYLON readers get $13 off! Use the promo code “NYLONXPS18” before 31 Dec 2018. Only one use per customer, per order. What’s more charming than a bracelet filled with charms? Not any Prince, for sure. These pieces of crafted sterling silver are bound to please any prancing princess looking for loftier aspirations. If you find them suddenly talking to animals and speaking in a sing-song voice, don’t blame us. If you are a true Disney fan, you should know the princess featured here is Disney’s very first princess, Snow White! With an apple in hand, Snow White makes her appearance in this Cath Kidston x Disney collection. Flaunt your love for this animal-loving princess with this cute tote bag! If you love Disney, but have an aesthetic to stick to, this Coach wallet may just be the thing for you to pay tribute to Mickey, while still looking chic! Uniqlo is well known for their cute designs and basic items. So, what do we get when we combine cute designs with wardrobe basics? A Mickey Mouse graphic tee! In light of Mickey’s 90th anniversary, Uniqlo teams up with Disney to present a whole collection called ‘CELEBRATE MICKEY’. Your Disney-crazed friends are sooo gonna love this. Drawn in by the glitz and glimmer? The collaboration between UK label Skinny Dip and Disney features this Holographic Mickey Crossbody Bag that will please any Disney fan! Fastened with a magnetic Mickey-shaped clasp and designed with a boxy silhouette for that statement outfit. The new Disney collab with Rag & Bone features a striking pair that imitates the silhouette of, well, a bowling shoe. This funky pair comes in accents of blue, white, red and yellow and the number 9 and 0, in commemoration of the 90th Anniversary. We’d spare you from the bowling puns, but we can’t help but to say that this collab with Rag & Bone is totally up our alleys. We all know about the Thom Browne Hector Bag and MCM’s Zoo Rabbit/Bear Doll Bag. 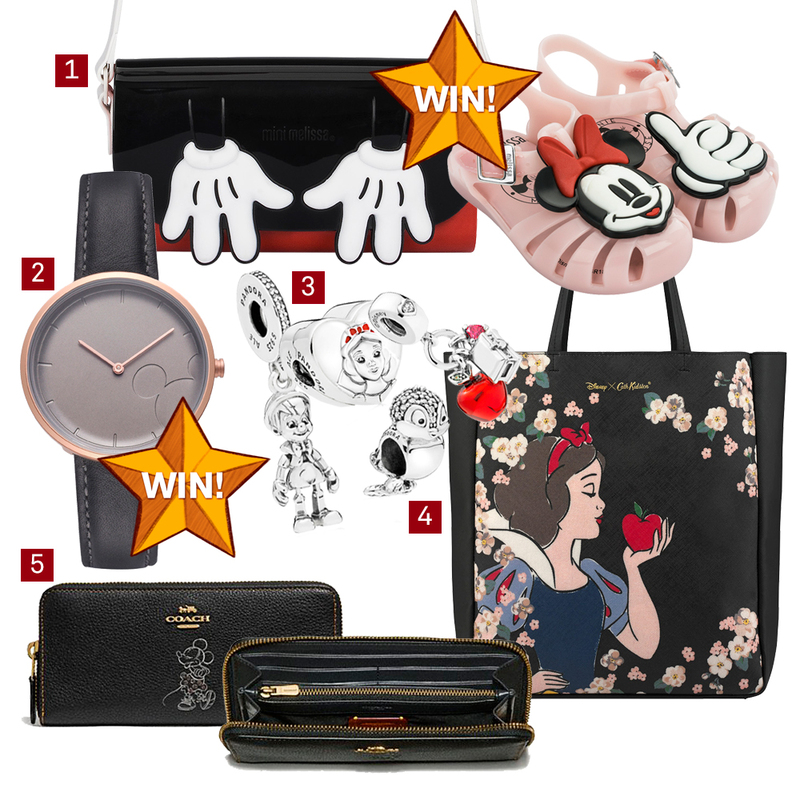 Want it Disney-style? Christopher Raeburn collaborated with Disney to release these cute bags in his FW18/19 Collection! This crossbody bag comes in red and black, packaged in a sleek hexagonal box for the perfect Christmas gift. Christmas is nearing, yet you haven’t gotten any gifts for your loved ones? Getting them a pair of cute Disney socks is a safe bet, and it will save you from having nightmares… before Christmas. The socks are made from a specialised combed cotton that is softer, stronger and smoother than other types of cotton. And not to mention, Classic Jack looks awfully cute! Say hi to Minnie peeking out at you every single time you open your wallet to pay for something, thanks to this black and white silhouette print in the lining. The bold navy blue wallet reminds us of the retro colours of old Disney films, and is stylish enough to be seen with. And the wallet is adorned with the Lacoste crocodile logo, which doesn’t give away your secret obsession for the lovable mouse! Everything’s a collectible when you’re a big enough fan. Just like this tin that comes in four adorable Disney characters — Mickey, Minnie, Donald, and Daisy. Other than for display, the tin also comes with 2 packs of Kit Kat fingers. Ooh, maybe you can use it to store your candy! Listening to “Hey Mickey” on your standard pair of Apple earpiece simply doesn’t do justice to the song. Turn up the volume and enjoy the best surround sound with this limited edition pair of Dr Dre Beats x Mickey Mouse collab headphones by Lil Yachty. Sporting the iconic character itself, these limited edition headphones come in lieu of Mickey Mouse’s 90th Anniversary. And who can forget the adorably innocent Bambi? The deer is the closest thing to a prince that you’ll get in a fairytale based around forest animals (Simba is King of the Pride Lands — it’s different! ), having a father who’s the Great Prince Of The Forest. Carry a little bit of whimsical charm everywhere you go with this Bambi-inspired necklace from Les Néréides Paris. It might even give you that extra inspiration to amp up the intensity of your pleading doe eyes when asking for more meat at the cai fan store. Here’s something that’s classic with a twist; the popular iconic Nixon design “gets a hand from Mickey Mouse” this time, with an hour hand that will point any time-seeker in the right direction. Those high contrast white details really pop off the black face, bringing you closer to the magic. Combine streetwear hype with your love for Minnie Mouse with this girly yet edgy pair of slides, with a classic bow in Minnie Mouse’s trademark polka dot print. It’s almost too pretty to wear to the wet market — try Cineleisure instead. Or wherever the cool kids go to hang.